From well-known oceanfront eateries to tiny hidden gems, Miami’s food scene closely mirrors its culture — it’s diverse, colorful, and too delicious to miss. 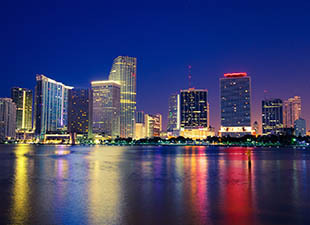 Florida’s second largest city is home to the largest population of Cuban-Americans, earning it the nickname “Capital of Latin America” due to its cultural influences. Get ready fill up your Instagram feed with mouthwatering, uniquely Miami eats at these seven great restaurants. Not all chicharrón are created equal. When you want to dig in to the city’s best, there’s only one restaurant to consider: El Palacio De Los Jugos. 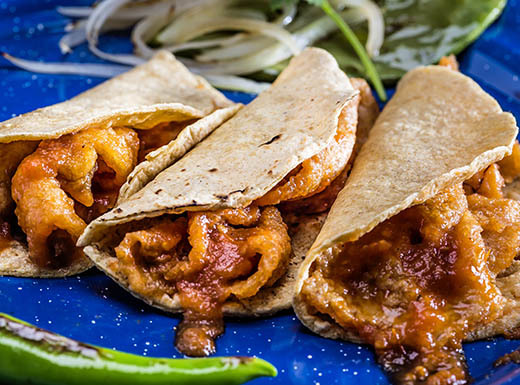 This Caribbean/Latin American-influenced restaurant serves up this South American staple a la carte or tucked into tacos. One bite of the deep-fried, salty pork skins is all it takes to hook you for life. 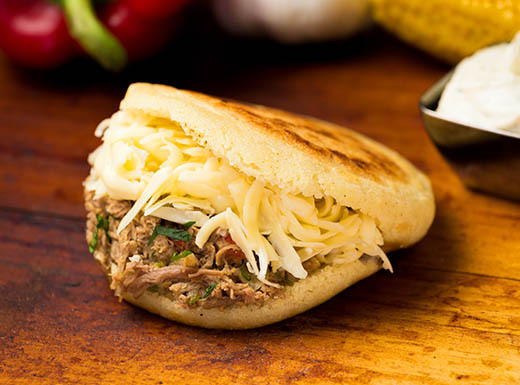 If you want to eat like a local, order your arepa with hearty pulled pork, avocado, and melted cheese. This Latin American dish features a maize-based dough stuffed with your choice of fillings before being cooked to a perfect golden hue. La Latina serves up a large menu of arepas for meat lovers and vegetarians alike, and the locals claim they’re the best in the city. Why grab a burger when you can dig into a frita — think of it as a Cuban burger — instead? El Mago de las Fritas serves its lightly spiced ground beef with some onions, mojo, and crisp shoestring potatoes. Eater Miami (a food news and dining guide) claims this restaurant’s fritas are so good that even former President Obama indulged when visiting Miami. In addition to its Latin American-influenced cuisine, Miami is also renowned for innovative young chefs who bring fresh flair to their dishes. This hidden gem, located on Pompano Beach, serves some of the city’s most inventive food, including specialties like Cheeto-encrusted mahi-mahi and a burger topped with smoked short ribs and pickled pineapple. A laid-back atmosphere and a menu that celebrates the Magic City’s diversity awaits you at 27, a hip restaurant located in a historical 1930s home built by architect Russell Thorn Pancoast. The menu features dishes from the Caribbean, South America, and the Middle East, with options like yucca fries, falafel, arepas, pulpo a la Huancaina, and a smoked pork chop served with plantain succotash. When it comes to sweet treats, Miami doesn’t disappoint. Although ice cream itself isn’t unique, this Miami favorite serves up special South Florida creations like ice cream filled with guava and Maria cookies as well as unique flavors like coconut flan and sweet plantain. As the state’s official pie, this dessert deserves its own listing. 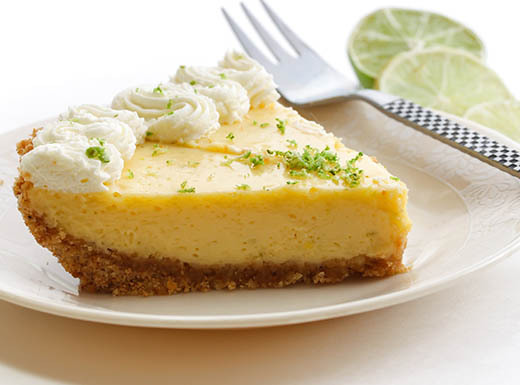 Creamy, cool, and tart, this slice of heaven is a Miami necessity. Locals love getting their fix at comfort food restaurants like Blue Collar or The Dutch Miami, which features a coconut sorbet, passion fruit sauce, and salted crust for a different take on the classic flavor. Did this get you excited to eat your way through Miami? Find more amazing foodie destinations and inspiration for your next getaway on our Instagram page. Planning a family vacation to South Beach, Miami? 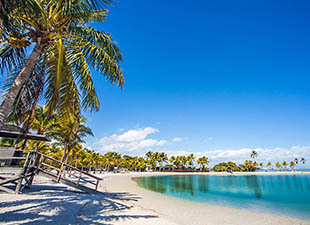 This trendy spot offers miles of white sandy beaches, exotic food, and enough activities to keep every family member smiling. 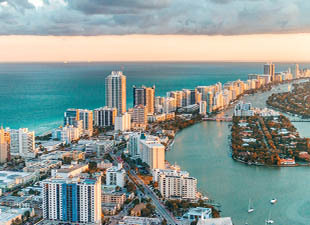 Stepping away from the sun and surf along Miami’s famous beaches may be difficult, but you can’t visit this city without exploring the thriving art scene that attracts visitors from around the world.